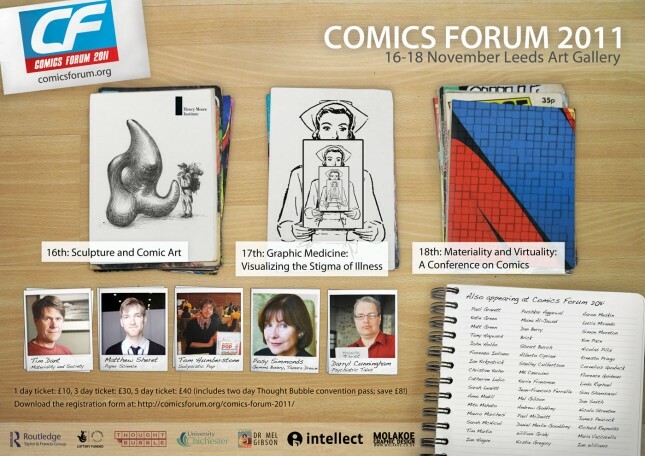 We were very excited to hold the third conference on comics and medicine as part of the Thought Bubble Comics Forum and are very grateful to the Comics Forum director, Ian Hague, for inviting us to take part. Many medical schools have encouraged the reading of classic and contemporary literature to gain insight into the human condition, a move generally seen as corrective to this century’s overvaluing of medical science and technology, that attempts to bridge the gap between knowing about a disease and understanding the patient’s experience of that disease. (Squire 1998, p128). As an alternative form of literature, and as an important visual presentation of the body and its social relationships, the medium of comics is attracting attention from healthcare scholars, clinicians and service users. An expanding body of academic literature on the subject and the enthusiastic reception for the subject at two recent international conferences held in London and Chicago signals the excitement that examination of the medium brings. The theme for this conference was Stigma, which has a number of meanings when applied to medicine: it can refer to a sign, mark, feature, indicator of something, which generally has a negative connotation; a moral or physical blemish; a distinguishing personal trait that is perceived as or actually is physically, socially, or psychologically disadvantageous; or any physical mark or peculiarity that aids in identification or diagnosis of a condition. With its history of radical narrative and innovative representation, comics seems well placed to examine the phenomenon and having had a strong response to our call for papers, a diverse line up of speakers who duly approached the subject from various angles. MK and I got the train over to Leeds from my home in North Wales the day before in order to catch the second half of the conference being held on the Wednesday: Sculpture and Comic Art, organized by Kirstie Gregory of the Henry Moore Institute, who had invited the Graphic Medicine speakers to a wine reception on the Wednesday night, which we duly attended. It was great to meet up with old friends from overseas and some of us went on to grab something to eat in a nearby Italian restaurant. The conferenced commensed at 10am the following day. After few opening words from yours truly, Session 1A, chaired by my co-organiser, Maria Vaccarella of King’s College, London, covered Stigma and Cognition. 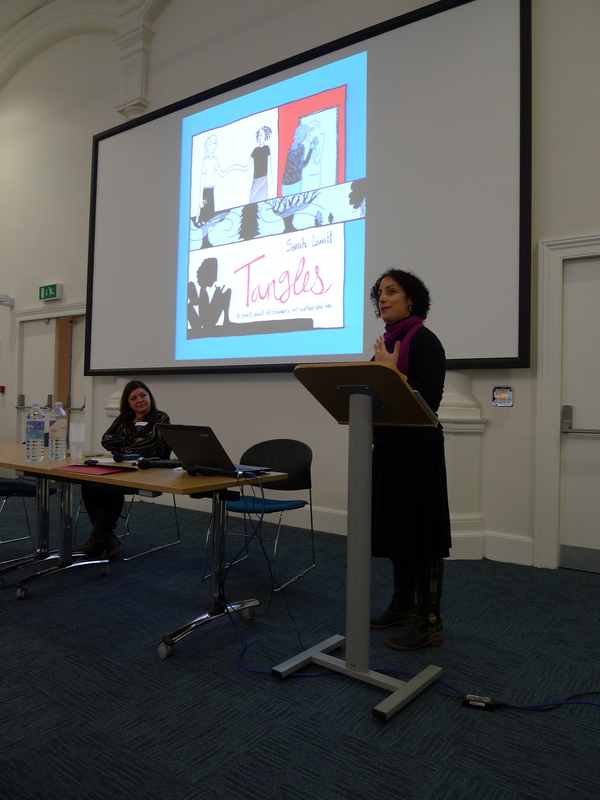 The two speakers were Sarah Leavitt, author of Tangles, who had come from Vancouver to speak and Lucía Miranda-Morla from Paris. Sarah gave a funny and moving talk about her graphic novel, which deals with her family’s struggle to cope with her mother’s Alzheimer’s Disease. Lucia spoke about Élodie Durand’s graphic novel La parenthèse a book dealing with epilepsy and memory loss that I shall have to order shortly! Session 1B, chaired by MK aka ‘Comic Nurse’ who has contributed excellent posts on the Comics Forum blog and who headed the organisation of our recent Chicago conference, covered Stigma and Disability. The speakers were Jean-Francois Ferraille who spoke about the representation of disability in bandes dessinées and Shelley Cuthbertson, who discussed disabled superheroes in the Marvel and DC Universes. After a half hour break for refreshments, Session 2A, chaired by me, was the first of two panels that cover Stigma and Autobiography, with speakers Andrew Godfrey and Katie Green. 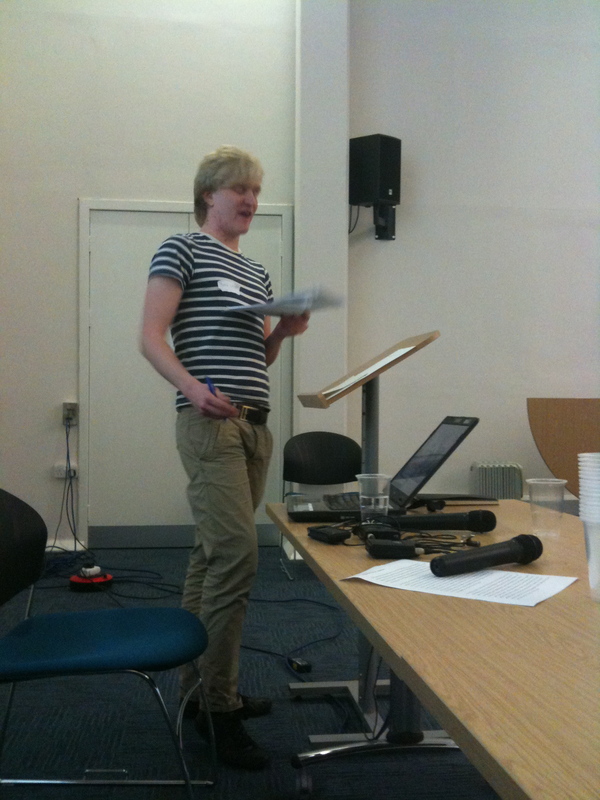 Andrew talk, entitled Breaking Down the Poster Child Syndrome was about his autobiographical comic The CF Diaries in which he documents his struggles to live with a terminal illness while getting people to treat him as ‘normal’, rather than as someone who has such an illness. Katie talked about her forthcoming graphic novel, Lighter Than My Shadow, due out from Jonathan Cape in 2013 which challenges common misconceptions about eating disorders and sexual abuse. Panel 2B, entitled Stigma and Community and was chaired by Fiorenzo Iuliano Postdoctoral Research Fellow in American Studies at the University of Naples “L’Orientale”. Simon Moreton unpacked how the collective constitution of stigma around physical and mental illness unfolds and how comics communities can be mobilised to challenge that process. Nye Wright talked about his forthcoming graphic novel Things to Do in a Retirement Home Trailer Park When You’re 29 and Unemployed…which deals with emphysema. After a break for lunch we started again at 2pm with Session 3A, entitled Stigma and Society, chaired by John Swogger, illustrator of There’s Something Different About Dad which featured Karrie Fransman and Fiorenzo Iuliano. Karrie has a new graphic novel coming out shortly, The House That Groaned, and examined the rise of both anorexia and obesity in Western society on the bodies of two characters in the novel. Fiorenzo discussed Charles Burn’s classic work Black Hole with respect to ideas of normality and stigma. Session 3B was the second of our Stigma and Autobiography. Nicola Streeten, recently featured in the Observer, talked about The stigma of mourning for too long, and the production of her recently published graphic novel Billy, Me & You. The comics artist known as ‘Brick’ talked about his graphic novel Depresso, a semi-fictionalized account of his decent into depression and his subsequent recovery which offers a sharp critique of conventional healthcare systems. The was be Mita Mahato, Assistant Professor of English at the University of Puget Sound, Washington State. A quick break for more coffee and tea preceeded our final parallel sessions- 4A, Stigma and the Reactive Body , chaired by Nicola Streeten, featured papers by Mita Mahato, Sarah McNicol with Simon Weaver and Paula Knight. Mita’s subject was the articulation of stigma and sickness through silent passages in David Small’s Stitches, Sarah and Simon examined notions of stigma in graphic novels that feature a child or young person with a nut allergy as the central character and Paula talked about the making of her forthcoming graphic novel about recurrent miscarriage and childlessness, The Facts of Life. Session 4B chaired by Maria Vacarella, examined Stigma and Caregiving. Muna Al-Jawad talked about using her work as a comics artist to explore the stigma of working as a geriatrician. MK Czerweic talked about the process of turning oral testimony, taken at the time of her working on an AIDS unit into a graphic novel and Linda Raphael presented a paper on Resisting Closure: Graphic Texts and the Search for a “Good” Ending. The day concluded with a keynote address by Darryl Cunningham, acclaimed comics artist and author of Psychiatric Tales who talked about his experiences as both a mental health carer and as a patient. Darryl has two more books due for publication shortly: Science Tales and Uncle Bob Adventures. As at previous conferences, there seemed to be a real buzz as comics artists mingled with healthcare professionals, medical illustrators and academics. This sort of interdisciplinary conference can be very exciting. One delegate announced that, of the 40 plus conferences he had attended during his career this one was the best! 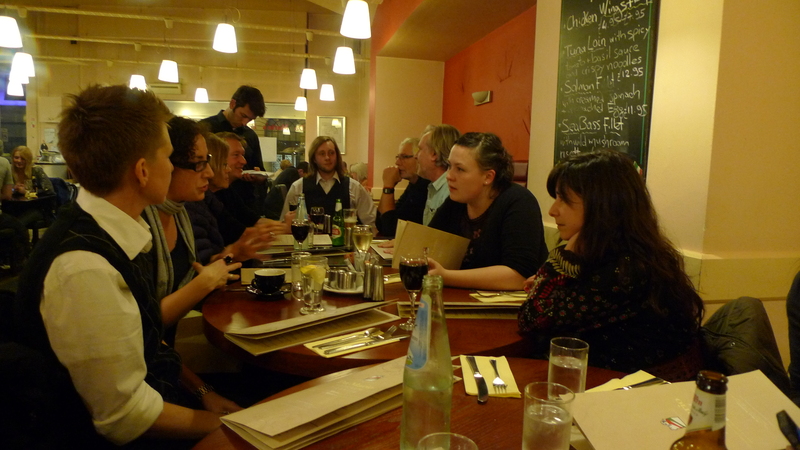 Many delegates went out for a Chinese meal that evening- the Thought Bubble Comics Forum official dinner. 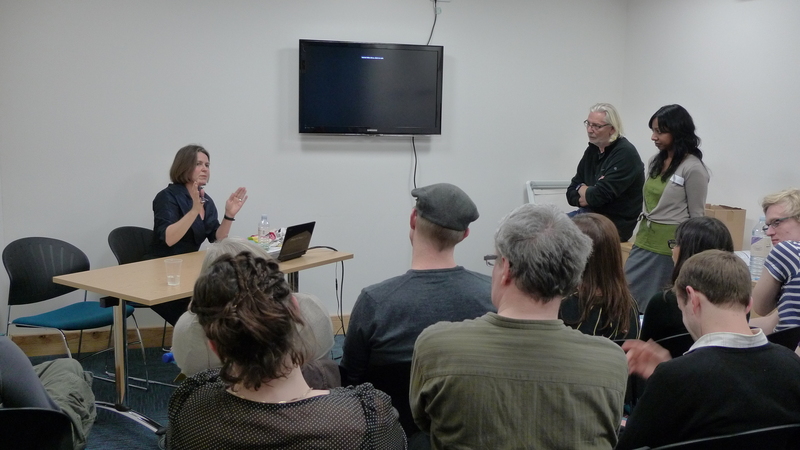 The Friday conference- Materiality and Virtuality- was very enjoyable, with one of my heroes, Posy Simmonds, giving a keynote address. I got to walk her back to the hotel, too, and had a good chat on the way. As Maria headed back to London, MK and I were gearing up to take part in the ThoughtBubble Convention as our alter-egos: Comic Nurse and Thom Ferrier, respectively. Then, exhausted after long days and late nights, it was down to London for Laydeez do Comics, where MK and Sarah were speaking. For me it was a long but very enjoyable week. Thanks to all the speakers and delegates who helped to make the conference happen, some of you travelled very long distances, I feel the conference was a success, I hope you do to. Many thanks to Hattie Kennedy and Emily Rabone for manning the desk and generally helping out with the running of the event. Hattie was tweeting incessantly as @comicsforum throughout the day.